Network Testers 15/03/2018 15/03/2018 No Comments on WiFi Lessons: Why channel 1, 6, or 11? Are you spending money for high-speed Internet and not getting what you expected? Was your WiFi network working fine and now you’re suddenly stuck with slow WiFi data rates? Selecting the proper WiFi channel can significantly improve your WiFi coverage and performance. In the 2.4 GHz band, 1, 6, and 11 are the only non-overlapping channels. Selecting one or more of these channels is an important part of setting up your network correctly. Currently, many wireless routers automatically select the channel for you upon initial setup, where depending on your wireless environment, it could lead to slow WiFi speeds and interference. Co-Channel interference isn’t a major problem until there are too many WiFi devices on the same channel. Adjacent-Channel interference, on the other hand, is where you run into problems and channel selection becomes critical. Luckily, these channel related interferences can be reduced or eliminated by selecting the proper WiFi channel for your network. Using a spectrum analyzer like inSSIDer Office will allow you to see this wireless environment, so you can either select the right channel or mitigate WiFi interference, ultimately improving your 2.4 GHz WiFi network performance. Each channel on the 2.4 GHz spectrum is 20 MHz wide. The channel centers are separated by 5 MHz, and the entire spectrum is only 100 MHz wide. This means the 11 channels have to squeeze into the 100 MHz available, and in the end, overlap. However, there are three channels that don’t overlap: 1, 6 and 11, as you can see in the image below. 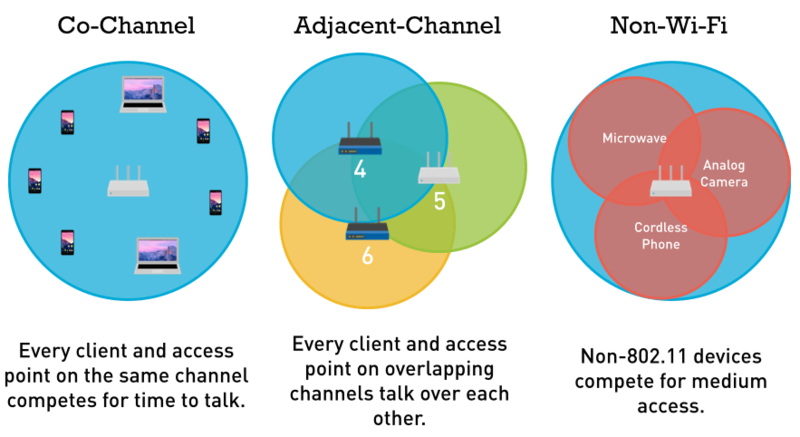 Co-channel interference is where devices take turns talking, so the more devices on one channel, the longer it takes for a device to talk since it has to wait for its turn. Armed with the above information, you’ve narrowed your selection down to three channel choices (1, 6 and 11) without using any software! Unfortunately, this doesn’t mean neighboring networks aren’t using non-standard channels. 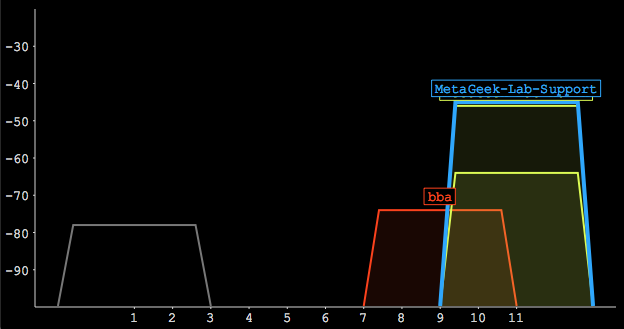 That’s where MetaGeek can help out. Using inSSIDer Office helps you visualize every network within inSSIDer’s reach, so you can finalize your decision. For more information about the types of channel interference, check out our Video Tutorials. The benefit of using inSSIDer Office is that you can now see what is causing your WiFi problems and fix them fast.inSSIDer Office will automatically recommend the optimal channel for you, and you don’t need to be a WiFi guru to use it. Just launch inSSIDer Office, and start out by counting how many networks are active on each channel. The first step is to click the “Channel” header to sort the channels in order. What you are looking for is the channel (out of 1, 6, and 11) that has the fewest networks present. Notice in the above image that the network called “bba” is running on channel 9, which is overlapping channels 6 and 11. There is only one active network on channel 1, and its signal strength is very low. If you are deciding which channel would be the best for a new access point, channel 1 has the fewest amount of networks and there aren’t any partially overlapping networks. In this example, the best channel to choose is channel 1.